"I didn't think it was going to get this big," said a trench-coat-clad 14-year-old Julia Bluhm as she stood in the drizzle outside the Midtown skyscraper where Seventeen magazine is headquartered. Bluhm was talking about the online petition she started asking Seventeen to produce one photo spread per month without the aid of Photoshop. Spread through social media, Bluhm's petition attracted around 6,000 signatures in ten days, and then — with the help of a press release from a San Francisco PR firm that led to broader coverage on blogs (including this one) — the number swelled to 13,000, then 16,000, then 20,000. As of right now, the petition counts over 26,000 signatories. (Bluhm had printed out just under 25,000 worth before this morning's protest to hand-deliver to Seventeen editor Ann Shoket). "This is really exciting," said Bluhm. "I now know that there are a lot of girls who feel the same way as I do about this." Bluhm — an 8th grader from Waterville, Maine, who took the day off from school to come to the New York demonstration with her mother — decided to start the petition because, she says, "We know that Photoshop can be very harmful to girls because they think they have to look like these images. But it's not even real, it's Photoshop. So it's kind of impossible to look like that in real life." Bluhm coordinated her petition with SPARK, a group she's active in and which organized today's protest — on the SPARK Web site, you can see posts Bluhm has written about body image and ballet, her chosen extra-curricular, women athletes she admires, and why it bugs her when her classmates call her "ladylike." "I chose Seventeen to target because I know that Seventeen is already doing a lot to help girls to feel better about their body image," Bluhm said, citing the magazine's Pretty Amazing contest, which offers college scholarships to girls who make outstanding contributions to their communities through volunteer work. Dana Edell of SPARK told me that the organization is coordinated by three adult part-time staffers, herself included, but tries to give as big a leadership role as possible to the 20 or so girls who are involved nationwide. 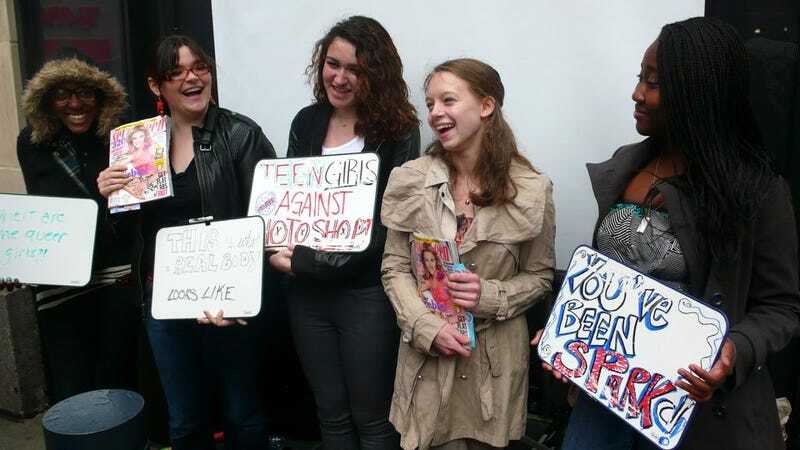 The nonprofit grew out of a 2010 conference on the issue of the sexualization of children, particularly young girls — its name stands for "Sexualization Protest: Action, Resistance, Knowledge" — and has previously tackled issues like Lego's gendered advertising. "We're excited to share with Seventeen that we're not the only ones that feel that their photo spreads are really dangerous to girls," said Edell, cradling the box of signatures. "Because they're presenting images that are not only unrealistic, but completely fake." Edell said that Seventeen had confirmed to her that Shoket would be available to receive the petition. "We'll see what happens." Change.org's Shelby Knox, acting as a PR for the demonstration, wrangled the nearly 20 reporters and photographers who had gathered to report on the five teenaged protesters. "You know what would be really fun?" Knox asked as the girls assembled for a photo call outside the Hearst building. "If you guys all hugged. Okay, now one where you hold your signs up! Hold up those magazines!" It was raining, and the demonstration seemed to attract little interest from passersby. After talking to a few more reporters, Bluhm took the box of signatures from Edell and walked into the lobby of the Hearst building, where she and her supporters were waved upstairs by security. The outcome of the meeting is unclear; the magazine did not respond to Jezebel's request for comment, and I was told that neither Bluhm nor any of the other protesters would have any "press availability" after the event.